The University Commons and Activities put on the Off Campus Living Fair in the Commonwealth Ballroom on March 27, 2014. Multiple vendors, representing a large variety of off campus apartments and townhomes, passed out informational flyers and talked to students about their off campus living options. The annual event was organized by Dominique Graves, the off campus assistant for university housing. “Every year we put on this event for students looking to move off campus,” Graves said. The event was created out of an overwhelming amount of student requests for off campus housing assistance. Representatives from 8 ½ Canal, The Collegiate, Iron House Condominiums, Monroe Park Towers and Clachan Properties were only a few of over a dozen vendors participating in the event. Many of the vendors also had raffles, prizes and giveaways which students signed up for when they took flyers and brochures. 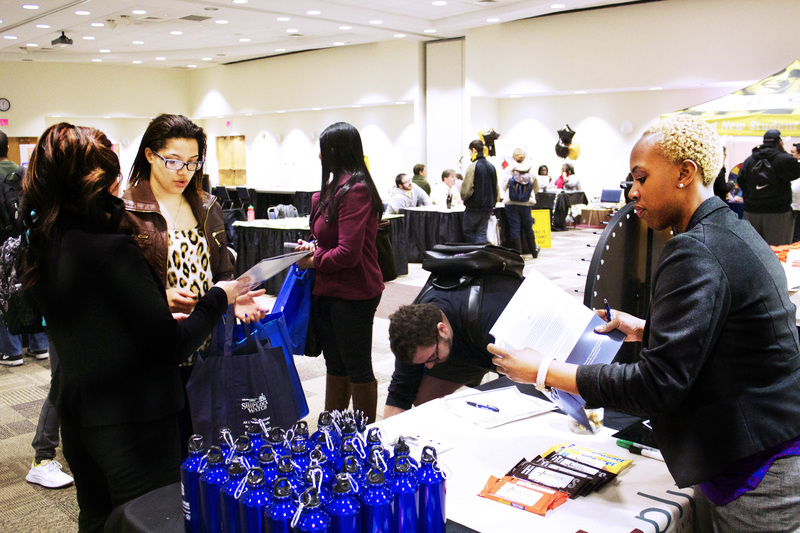 University representatives such as Graves were also available to talk to students about accommodating their needs in their search for off campus living, such as location, price, roommate matching, size and more.